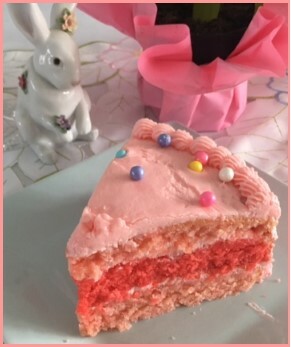 This lovely little Pink Lemonade Cake was a grand success as the finale of our Easter Dinner. The flavor is light and refreshing which is a perfect end to a large meal. It is a very basic recipe but there was one glitch in the Better Homes and Gardens recipe which is posted here without the error, of course. necessary height required for the full shading affect. I will make it again the way I imagined it (as seen on the right). This beautiful work was done by stylesweetca.com where you can go for detailed instructions on how to do this technique. Believe me, I will be flipping through it as I frost mine! A technique for any color! Ingredients and Instructions. . . Grease two 9 inch round cake pans and line bottoms with parchment paper. Grease and flour, tapping lightly to remove excess flour. In a large mixing bowl beat butter for 30 seconds and add Sugar gradually on medium until well combined. Scrape sides of bowl and continue beating for two minutes. Now, add 1/8 teaspoon of RED Food Coloring beating to combine. Then add the Eggs one at a time, beating well after each addition. Do not be concerned that the liquid ingredients appear curdled. Give them a little stir before alternating adding it between the flour - begin with the flour and end with the flour. (I use about four additions each) Beat on low after each addition and DO NOT over beat, only until everything is combined. Now this is very important if you hope to achieve a four layer cake. Remove 1/2 the batter, as exactly as possible,Coo from your mixing bowl and place in one of the prepared pans. Then add another 1/4 teaspoon of Red Food Coloring to the remaining batter, stir well and place this batter into the second pan. Bake for 30-35 minutes until a toothpick in the center comes out clean. Cool in pans on wire racks for 10 minutes. Then remove from pans, peel off the paper, and continue to cool dome side up until completely cool. Trim off the domes so the cakes are flat and carefully cut each layer into two. Now you're ready to frost the cake. 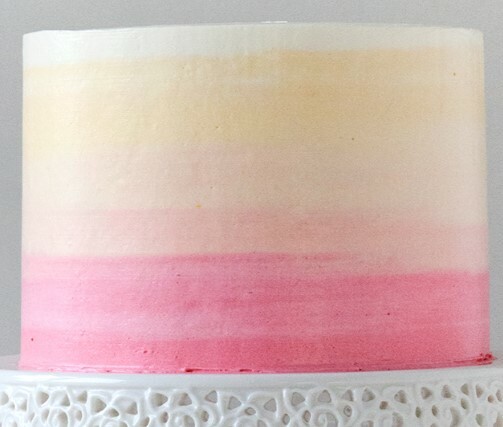 See Pink Lemonade Frosting, Ombre Frosting (linked above), Buttercream or a Buttercream/Cream Cheese would also be delicious. From my heart to yours. Buon Appetito!